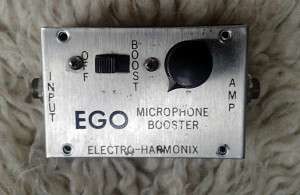 Electro Harmonix Ego Microphone Booster. Made in US around 1969, according to pot labels. Got this unit as a defunct gift from J. Stolpe of Väinö Grön (and numerous other bands/musical outfits). Story is the he found this unit from his father’s belongings and kept it. As we got into talks about my favourite subject in the world, he just decided to give it to me. The signal was passing on “bypass” mode and when the battery was connected and the boost engaged it acted as a dirty buffer. After looking into the design, it became clear that the design is 1:1 with all the original LPB-1s and 2s. All it takes to create a one transistor boost is an input cap, two resistors from supply to base and base to ground (these two form a bias voltage for the transistor), gain setting resistor from emitter to ground and a resistor from supply to the collector. Oh. And a output cap. Boost control is your standard 100K pot (output cap to lug 3, lug 1 to ground and lug 2 is your output). 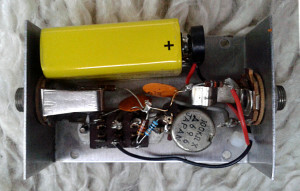 By the way, Beavisaudio has a perfect one paged article/image about how the single transistor booster works. If you’re not familiar with the subject, check it out here. The fault in this unit was with the resistor from transistor emitter to ground. It was completely burned out and cut in two. Looked like someone had already tried to fix it with not so great results. I was afraid that the 36999 branded transistor was dead due to the heat. Those transistors are apparently Fairchild made clones of 2N5088, that they manufactured for EHX in late 60s. I have no way of verifying this information, but it was on the internet, so it *must* be true. Anyway. The burned resistor seemed like 330R in value, so i went through all my boxes and drawers for similar carbon composition resistor to match the original. Nope. I didn’t have any. So i just fixed it, no matter of the cost. As you can see in the photo above, there’s one resistor that doesn’t quite match the others. I used the standard 1/6W 1% metal film resistor in its place. Works. And even the original transistor works perfectly! 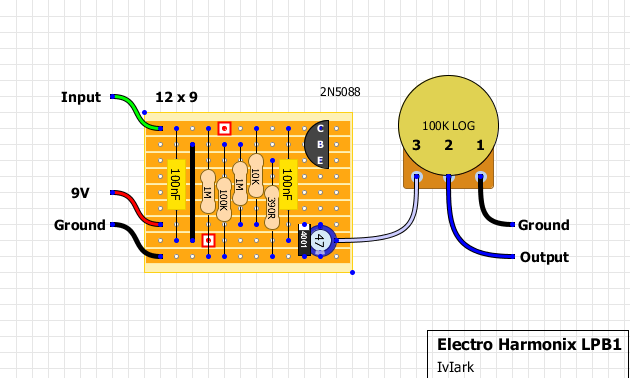 Then i thought to myself, “what makes this a microphone booster, as the circuit is 1:1 with Linear Power Booster?” The jacks. That must be it. The LPB has the other end as a plug – you know, to be used with a guitar. If there are two jacks, then it must be for the microphone. Damn i just love vintage stuff like this! Exactly like the linear power booster(s). Clean and loudish to the ~90% of the knob sweep. And then badly distorting at the end. The circuit keeps the frequencies well in tact while the line driving capabilities are worth a mention. Not great thing, but very cool little tool to have. In fact, i’d recommend every guitarist to use one of the LPB-1s in their lifetime. It should at least open ones eyes to the idea behind loud “clean” boosters. 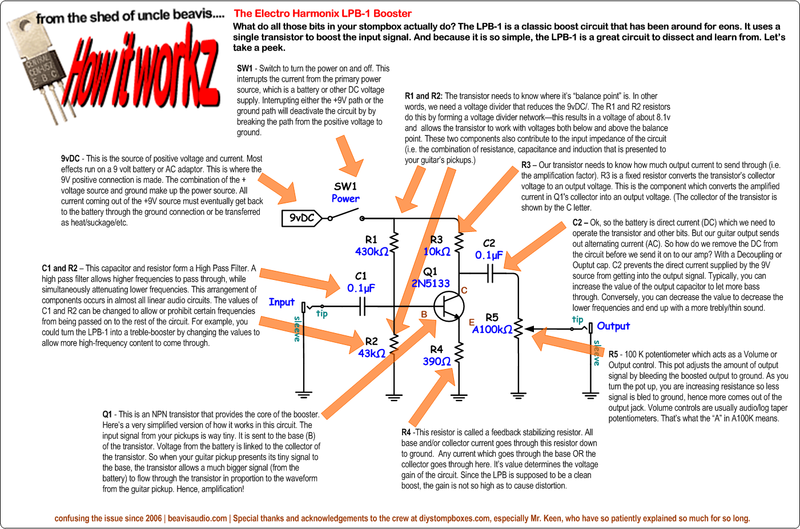 This entry was posted on Sunday, March 9th, 2014 at 23:08	and is filed under Electro Harmonix. You can follow any responses to this entry through the RSS 2.0 feed. You can leave a response, or trackback from your own site. I received one to these from a guest who staying at a hotel i worked at in IL. I accidentally disconnected one of the wires attached to the pot. So it has worked since then. It did work before I did that. So, I’m planning on reattaching the wire soon do to the fact I just got a sobering iron for christmas. My questions for you is…. 1. How many decibels do you think this neat ego trick adds? 2. Do you think it would be hard to build one from scratch? Entries (RSS) and Comments (RSS). 27 queries in 0.217 seconds.